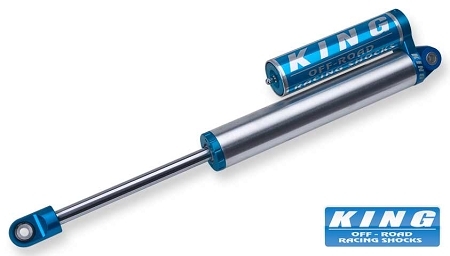 Designed for use with the stock or modified rear leafs these King smooth body shocks are built from the same materials and to the same tolerances as our top of the line race shocks. Their smooth good looks are matched by their smooth performance. These versatile shocks can be built in several configurations to fit your needs and are fully serviceable and adjustable with simple tools. These come with a piggyback reservoir. A set of King, smooth body shocks, are all you need to make your suspension perform to its full potential. These are designed to mount into the factory shock location. These are measured as lift height over stock. For example, a 6" lifted truck with a level stance is only a 4" over stock rear lift amount. A 6" lifted truck with a factory rake to it, would be a 6" rear lift height. THESE ARE CUSTOM BUILT FOR US BY KING TO OUR SPECS. ONCE ORDERED ONE OF OUR REPS WILL CONTACT YOU TO FIND EXACTLY HOW YOU USE YOUR TRUCK AND WHAT YOU WANT OUT OF IT TO ENSURE THESE PERFORM AS WELL AS THEY LOOK! We recommend these to be paired with a matching set of King front shocks for a proper balance and ultimate ride improvement.